Hologram labels are highly customizable, security labels that are used for product authentication, security, protection, packaging, documents and more. Holographic labels are ideal for protection against counterfeits and can be used for a wide variety of purposes. Best of all, hologram labels are now a very cost effective solution for companies and organizations of all sizes. Holography was originally invented in 1962 but was not adopted into commercial use until the early 1980’s. 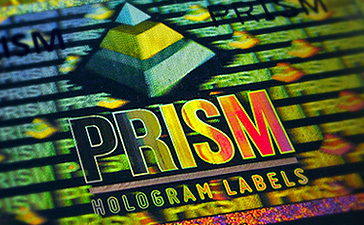 The science of Holography (as it is related to hologram labels) is to create 3D images and the dynamic movement of color on a carrier film, such as silver or gold hologram foil materials. To do this a hologram master is first created using lasers or electron beams and is then transferred to the carrier material. Holographic labels are most commonly recognized by their reflective and dynamic color qualities. It is these qualities that provide holographic labels with their unique security and protection capabilities. As the user views the label from different angles, the color associated to each element begin to cycle through the colors of the rainbow. For example, a user views a hologram label at a certain angle. One of the elements on the label appears Orange. As the viewer shifts their perspective, the element on the label cycles to the next color of the rainbow, in this case Yellow, then Green, then Blue and so on. Likewise, shifting perspective in the opposite direction will cycle through the colors of the rainbow in reverse order. Since all elements on a label are designed to start at different color start points, each element will cycle through the colors of the rainbow and hit certain colors at different times. This is what gives hologram labels it’s “dynamic color show” capabilities. Today, hologram labels are more than just reflections and colors. Materials, adhesives, in-design techniques, on-label techniques and value-added features greatly enhance the capabilities and overall effectiveness of hologram labels.